Everywhere you go it’s Rondo this, Rondo that, but how could we ignore him after this past weekend? For weeks, rather all season long, there’s been talk and rumors of Danny looking to trade Rondo. With Rondo sidelined earlier in the season, the C’s rode their largest win streak of the season. The combination of his inconsistency and poor attitude, accompanied with an urge for team improvement were all pointing him in one direction…away from Boston. 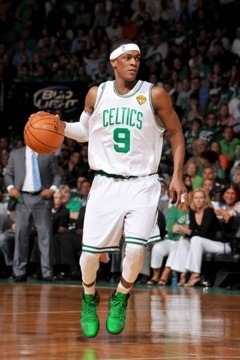 Sunday, Rondo once again showed Danny and the rest of the city why he belongs in green. From day one, I’ve thought the idea of getting rid of our young, dynamic point guard was a mistake. With potentially the last run at the finals left for the Big Three, losing Rondo would leave us with nothing next season. Each time we doubt him he proves us wrong. After putting up Hall of Fame numbers against the Knicks Sunday is there really any argument left? Leibo made a good point yesterday in his article (Rondo vs. Williams). The NBA has seen ten triple-doubles this year. Four of them are from Rajon Rondo. I think it’s safe to say he’s staying in Boston. Either way, what do you guys think? Keep him or trade him in hopes of something better? This entry was posted in Celtics and tagged boston celtics, boston sports blog, Danny Ainge, nba, rajon rondo, trade by jtulz07. Bookmark the permalink.